We love the small dark green glossy foliage on this Australian native plant. Small blue flowers appear on growing tips in warmer months. This cute low growing plant with a ground cover type habit creeps over the edges of ponds and rocks. This plant is also a great food supplement for fish. Spreads up to 40cm in diameter. Can be grown in a bog garden or shallow pond up to 15cm deep. This is a low maintenance plant that is good at filtering water. 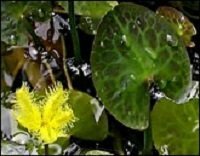 Creates an excellent frog habitat around the edge of a pond..
Add colour to your pond with this striking little Australian native water plant. This is a popular choice because of the dark tortoise-shell-patterned purple and green variegated leaves that add colour when not flowering. Prolific small star-shaped yellow fringed flowers in warmer months with a long flowering season. A real favourite. Floating leaf tendrils spread up to 1m in diameter. Can be grown in shallow or small ponds but needs to be fully submersed up to 30cm deep. Low maintenance, remove dead leaves as required. Provides shade for fish during summer months and some camouflage for fish to help prevent bird attack. Frogs love to attach their spawn/eggs to the leaves of this native water plant. A stunning soft pink-flowering arum with lush deep green leaves that creates a lush tropical look. Clumping plant that reaches up to 50cm high. Full shade to filtered sun. Low maintenance, remove dead flower heads and leaves as required. 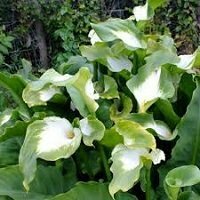 Creates an excellent frog habitat, they love to hide amongst the fleshy stems..
A gorgeous green and white flowering arum with double variegated leaves (spots and marbling). This lovely goddess creates interest and a lush tropical look in any pond or water pot. Clumping plant that reaches up to 40cm high. Creates an excellent frog habitat, they love to hide amongst the fleshy stems. 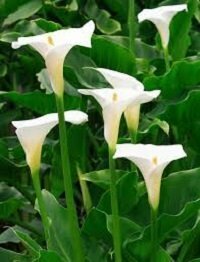 We love this classic white flowering dwarf arum with pointy bright green leaves and stunning white flowers. This gorgeous water plant creates a lush tropical look year round even when not flowering. Clumping plant that reaches up to 30cm high. 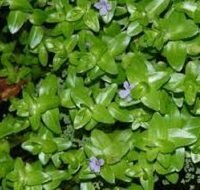 A pretty little Australian native plant with small dark green foliage and attractive purple or white flowers in warmer months. This is a low growing plant with a groundcover-type habit that creeps over the edge of ponds and rocks. Spreads up to 50cm in diameter. This is a low/medium maintenance plant that may require light pruning to maintain desired shape. This cute little Australian native water plant just loves sitting on the side of a pond or water feature. 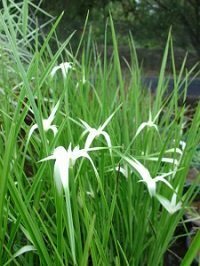 Small star like white flowers appear on growing tips in warmer months. The low growing habit makes this an ideal foliage plant for little frogs to hide in. Spreads up to 30cm in diameter. Can be grown in a bog garden or fully submerged in a shallow pond up to 15cm deep. Ann Australian native water fern that has four leaf clover-like floating leaves with a bright yellow spot in the centre of each leaf for added colour. 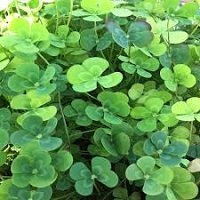 Mainly grow as a foliage plant, the cheery ‘lucky clover’ leaves make a beautiful display in any pond or water garden. Can be grown in shallow or small ponds up to 30cm deep. Medium maintenance, remove dead leaves as required. Frogs love to attach their spawn/eggs to the leaves of this native plant. This beautiful and versatile plant has gorgeous green pompom like foliage that creates an architectural look in formal ponds or a soft lush look for a tropical garden feel. One of our all-time favourites, this plant is always a great choice for ponds and water gardens. Clumping plant that reaches up to 100cm high. Best in full shade but will tolerate full sun. Can be grown in a bog garden or shallow pond up to 10cm deep. Low maintenance, remove dead heads as required. Water Lilies for sale - Nymphaea sp. Everyone LOVES water lilies! So we have lots of water lilies for sale! Their classic flowers are big, beautiful and evoke Japanese water garden ambiance. We love them because when one bloom opens, another is usually pushing its way up to keep the display going for a large part of the year. You can’t get much better than these in your pond. 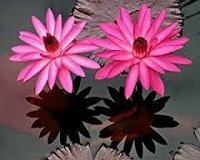 We recommend getting a mixture of temperate and tropical water lilies so that the flowering is more evenly spread out over the spring, summer and autumn seasons. Temperate (sometimes referred to as "hardy" water lilies) are more likely to keep some leaf cover over winter as well. Floating leaves spread up to 1.5m in diameter. Best in full sun. Will cope with limited semi-shade but… less sunshine means less blooms. Can be grown in small ponds but needs to be fully submersed in up to 60cm water depth. Low maintenance, remove dead leaves and flower heads as required. Warning! Koi like to nibble around the root zone of water lilies so we recommend a layer of gravel on top of the pot to discourage fish from digging. 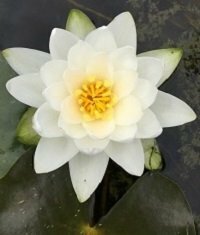 These are the toughest water lilies often from temperate climates with cold winters. They range in colour from white to yellow, pink and red and include gorgeous two-colour peach/orange/yellow varieties. 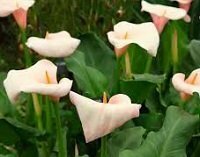 They have rounder leaves, their flowers tend to sit closer to the water and they usually flower earlier than tropical lilies. These water lilies keep their leaves throughout winter. Even though Tropical Water Lilies come from warmer more tropical regions, the varieties we sell do well in temperate NSW conditions. Tropicals tend to have taller flowers, pointier leaves, and continue to flower until late in the season. Their flowers range in colour from whites and pinks to purples, mauves and blues. These water lilies die back completely in winter but re-shoot in early spring. These amazing lilies open their flowers at night instead of the day releasing their delicate fragrance into the night air, however their flowers often stay open on a cool morning. They have some unique flower and leaf colours ranging from dark burgundy leaves with attractive serrated edges to stunning dark pink blooms. A great pond flower to impress your dinner guests! A very popular Australian native water plant. 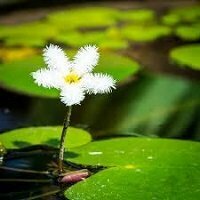 Small star-shaped white fringed flowers pop up near the top of the water lily-shaped leaves. This happy little plant is a prolific bloomer with a long flowering season through the warmer months of the year. This bright green Australian native is a favourite of ours and has long reed-like three-sided leaves. 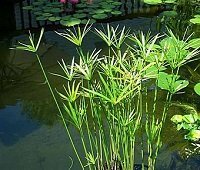 Attractive small flower/seed heads appear on the ends of the leaves adding interest and texture to any outdoor pond or water pot. Clumping plant that reaches up to 80cm high. Can be grown in a bog garden or pond up to 20cm deep. Very low maintenance, remove dead/bent leaves as required. A tough Australian native with blue-grey cylindrical foliage. We love this water plant as it has stunning architectural form and features small cigar like flowering pods. A great height addition to any water feature or pond. Clumping plant that reaches up to 200cm high. Can be grown in a bog garden or fully submerged in a pond up to 60cm deep. Very low maintenance, remove dead/bent reeds as required. 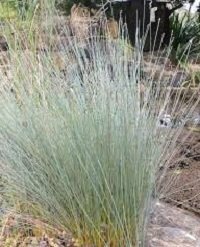 A small and delicate Australian native reed with blue-grey cylindrical foliage. Tough and hardy, this interesting water plant looks good all year round. We highly recommend this gorgeous little rush to add texture and colour to your water pot, fish pond or bog garden. Clumping plant that reaches up to 60cm high. Can be grown in a bog garden or shallow pond up to 30cm deep. A common native reed that you will see growing around Sydney tidal flats and river banks. Clusters of small seed heads appear on the tips of the leaves and add a gentle swaying movement to this beautiful water plant. Clumping plant that reaches up to 150cm high. Can be grown in a bog garden or pond up to 30cm deep. Very hardy and very strong. 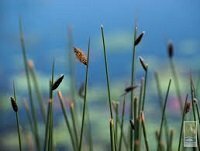 Low maintenance, remove dead/bent reeds/seed heads as required. A slow growing large rush suitable for any pond or water garden. 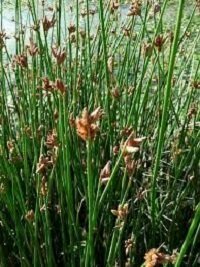 Has small brown leaf brackets along its stalks that make it look striped adding colour and interest. A highly recommended water plant. 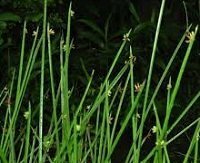 A common Australian native rush or sedge that you will see growing around damp bush areas and river banks. Clusters of small seed heads appear in warmer weather sometimes staying on the plant for many months. The firm strappy leaves add a lovely dark green colour to your pond or water garden. A great choice for non-green-thumbs! 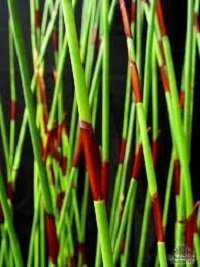 Another of our most popular plants, this pretty water lover adds architectural height and movement from gently swaying umbrella-shaped leaves. Grown mainly as a foliage feature plant, small seed heads appear in the centre of the leaves in warmer months. Best in full shade but will tolerate limited sun. Can be grown in a bog garden or fully submerged in a shallow pond up to 30cm deep. Low maintenance, remove dead heads/leaves as required. One of our favourite little pond plants. Bright white spider-like flowers appear in abundance during warmer months. Super bright lime green leaves make this a cheery addition to any water feature or pond. Can be grown in a bog garden or in a pond up to 20cm deep. Hardy plant that dies back in winter. Low maintenance, cut back to soil level once plant dies back in winter. This cute little water plant has spreading soft round foliage with red stems and an abundance of small pink flowers throughout Summer. A great low growing colour addition to the edge of a pond or water feature. Clumping plant that spreads up to 30cm in diameter. Low maintenance, may require light pruning to maintain desired shape. You can’t get a bigger or more showy water plant than this! 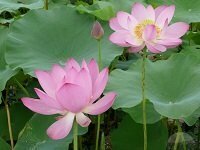 Also known as Sacred Lotus, these incredibly large-leaved perennial plants have huge symmetrical flowers that turn into large seed pods loved by florists. Flowers range in colour from pure white and yellow, light and dark pink to showy two-colour varieties. Please note: These heavy feeding beauties need to be kept separate to fish so we sell them in a self-contained pot for you to enjoy as a feature next to your pond. A tuberous plant that reaches up to 150cm high. Needs to be fully submerged in a self-contained pot up to 60cm deep or planted directly into a pond with NO fish. Feed every two weeks during the growing season. Low maintenance, remove dead leaves and seed pods as required. Louisiana Water Iris - Iris sp. Louisiana Irises are very easy to grow. We love the huge flowers which come in variations of white, yellow, pink, red, blue, dark purple plus many two and three-colour combinations. Long strap like leaves provide height until the tall flower spike pushes up large showy blooms in spring. We think these are a must-have in any water garden or pond! Clumping plant; dwarf up to 30cm, medium & tall up to 100cm high. Low maintenance, remove dead flower heads/leaves as required. 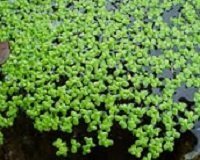 A top seller, this miniature aquatic plant floats freely on the surface forming a delicate bright green mat. Quick growing, this tiny plant is a great food supplement for koi and goldfish…. they just love it! Free floating plant that can double its size fortnightly in warmer months. Provides shade across pond surface. Adds camouflage protection for fish from bird attack. Water Fern / Fairy Moss - Azolla sp. 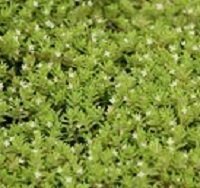 Another top seller also known as Fairy Moss, this little fern is a small plant that floats freely on the pond surface, often forming a pretty reddish mat. 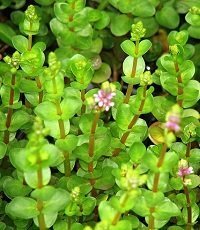 Quick growing, young Water Fern is generally bright green, becoming pink/red/brown as the plant matures or when grown in full sun. Very high in nitrogen, this delicate floater is an excellent food supplement for koi and goldfish. Go on, treat your fish by adding some to your pond! Free-floating plant that can double its size fortnightly in warmer months.